Whilst Tess has been travelling overseas and experiencing life around the European showjumping circuit (including the Longines Global Champions Tour), our showjumping team was out in full-force on July 15 at the SSJC Competition. Congratulations to Libby Nealon (another of our Level 1, EA accredited coaches at Peppertree), Georgia Apps, Juliette Petro and Sabine Sault who all pushed a little beyond their comfort zone and stepped up to new challenges to improve their performance – and have FUN! We look forward to Tess sharing details of her adventures upon her return (just in time for The Rider’s Series event on August 18-19). 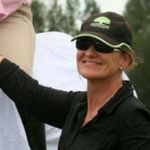 LouLou is a qualified instructor with more than 40 years experience coaching and as a competitive showjumper. Brilliant jumping at a superb venue! Terrific performances all round on the October long weekend! Get an update on our latest racing pursuits.